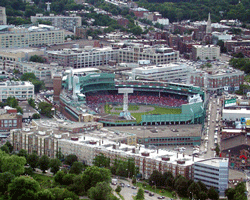 Linda Bassett, writing in the Norwich Bulletin, gives an excellent play-by-play account of the aromas that fans encounter on their way to Fenway Park for a Red Sox game. To get the real fan experience, you first need to take in the musty stench of the Kenmore T stop and the fumes that rise from cars and trucks trolling the Massachusetts Turnpike . . .
you inhale the first heady scent of Italian sausage, peppers and onions sizzling on the Sausage King’s grill. There are others; oh, yes, the area outside Yawkey Way is riddled with sausage stands vying for customers. Walking along, the smoke from steaks charbroiling at Burton’s Grill adds to the perfume. Closer to the park Ms. Bassett (was there ever a better name for such a scent-minded writer?) picks up roasted peanuts, tangy mustard from the Monster Dogs, spilled beer, and mid-game the sugary smell of cotton candy. Meanwhile, the latest, a cacophony of grease mixed with jalapenos and burnt garlic, doesn’t mesh with tradition. Give me my hawked peanuts, popcorn and Cracker Jacks I remember from childhood games. But chicken fingers, clam chowder and Dunkin’ Donuts coffee are a distraction in the stands. Keep them imprisoned in the insulated boxes above or the concourse below where the game flickers impersonally on overhead screens. And while we’re on the subject, how about showing some sock, Sox? I couldn't agree more. Ms Bassett has an amazing way of conjuring up memories, not just scents. What an amazing piece . . .